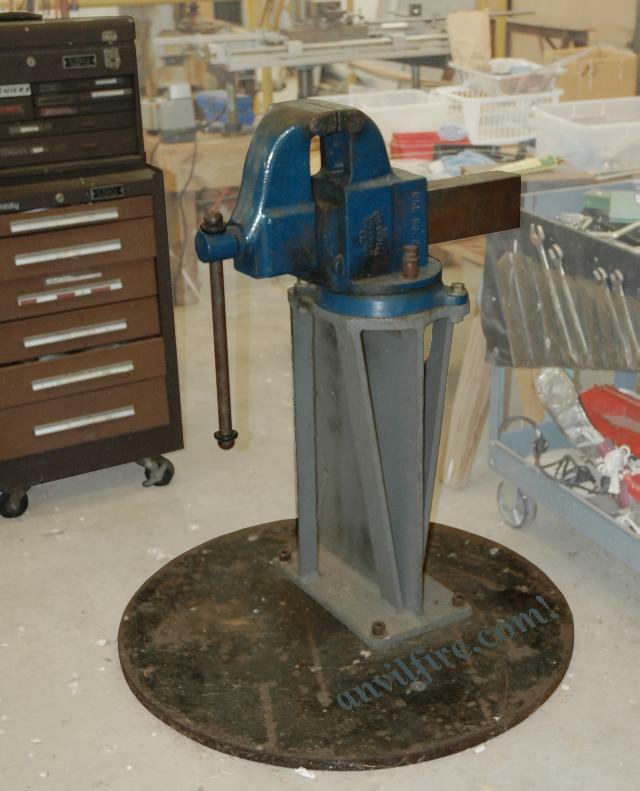 This large vise and the I-Beam stand came from the blacksmith shop I bought out of the 1930's cellophane factory in Fredricksburg, Virginia. It was the welding shop vise at Mechicanical Equipment Company, Rustburg, VA from 1980 to 1995. Then it was made "portable" by bolting it to a three foot diameter piece of 1" steel plate. Now it is back in the anvilfire.com R&D shop. Steve Kayne gave me the rubber electrical grommets to put on my vise handles many years ago when I visited him in Long Island, NY. They work great at quieting the vise and offer a little protection against pinching. They are still working 40 years later! This Vise is made of ductile iron with steel parts. This vise has replaceable hardened steel regular jaws and 3 interchangeable pipe jaws (missing). The screw is covered by the heavy front jaw and slide. The tall opening to accept large pipe jaws makes the vise convient for larger work. The weakness of this vise is the rotary base is difficult to lock tight enough for bending and other leverage operations in the vise. This has resulted in the locking nut levers breaking off and the nuts being chewed up by use of a pipe wrench. Reed had a solution for this. Stand, Beam W30 x 116 about 125lbs.